Day 65: The Anti-Life Equation! Posted 4 December 2010 in Apokolips, Day Entries, Earth, The New Gods #1, Weapons & Devices. The great MacGuffin of Jack Kirby’s Fourth World is the Anti-Life Equation, the nebulous object of Darkseid’s intense desire, the power that will give him control over every living being in the universe. But the secret of the Equation is locked inside of the mind of human or humans unknown and a great deal of the Master of the Holocaust’s energy in the first half of Jack Kirby’s magnum opus is devoted to the pursuit of this, the ultimate power. And Darkseid’s threat weighs on Superman’s mind, even as he travels the Boom Tube to be with people of similiar abilities as he in a place called Supertown. “Does the answer really lie ahead of me?” the Man of Steel asks himself, beginning to doubt his selfish action. “Darkseid and his hidden terrors — The Anti-Life Equation — The danger to mankind — Am I going the wrong way? Is Earth the battle ground for some strange Super-War? It could be as real as the Boom Tube! — And I may be deserting mankind when it needs me most!” Needless to say, Superman returns to Earth. And Mantis, in his destructive attack on the city, is lauded by Darkseid, as Desaad evidently works his Fear Machine (which might be able to detect a possessor of the Anti-Life Equation), as Darkseid states, “Mantis is inspiring great results! He’ll shake every mind in that city to its very roots! Especially the mind we seek to contact — the one that must be made to yield its secret — the Anti-Life Equation!” But The Infinity Man defeats Mantis and the Forever People ponder, “Mantis wants only the ego power of the conqueror!” [Beautiful Dreamer]… “But it’s Darkseid the universe must truly fear!” [Big Bear]… “He wants the ultimate power! And it is here — on Earth — in the mind of someone nameless — the ability to solve — and put into action — the Anti-Life Equation!” [Mark Moonrider]. The dreaded Fear Machine, created by Apokolips chief torturer Desaad (made from “the blueprint of the weird,” according to a cover blurb), just might be able to ferret out the secret from Metropolis citizens in New Gods #2. “Emotional turmoil breaks the dikes of the mind,” Darkseid tells his old friend, “and releases the flood in which we must fish, Desaad! Perhaps in this very city is the mind which will yield the Anti-Life Equation! The ability to control all free will!” But the Fear Machine fails Darkseid and so he turns to another within his powerful elite. 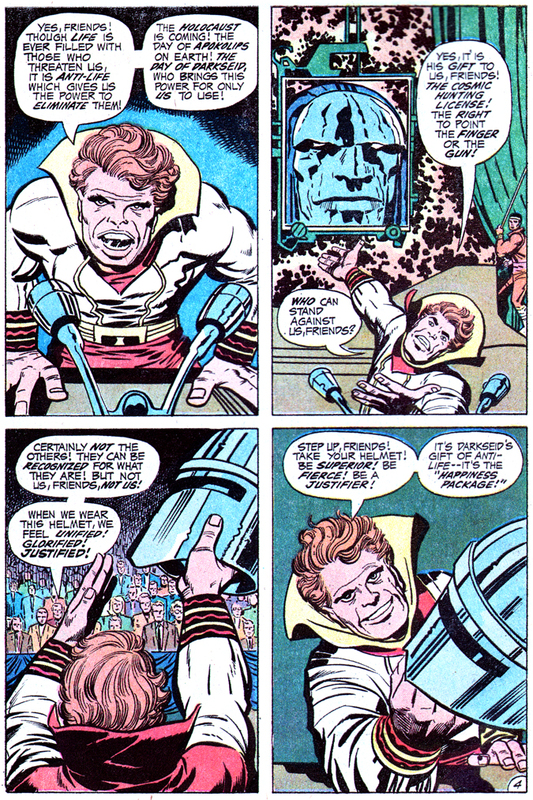 It seems Godfrey’s mesmerizing power of persuasion is linked to the “demon’s organ” played at his revivals and, naturally, The Infinity Man arrives to destroy it (though at great cost as the amalgamated Forever People character is exiled by Darkseid for doing so until appearing again in the very last issue of the series). But Desaad is aware Sonny is only one part of the equation: “Sumo, without mind stimulation from the Mother Box, can’t use the Anti-Life Equation! !” the torturer tells his master. 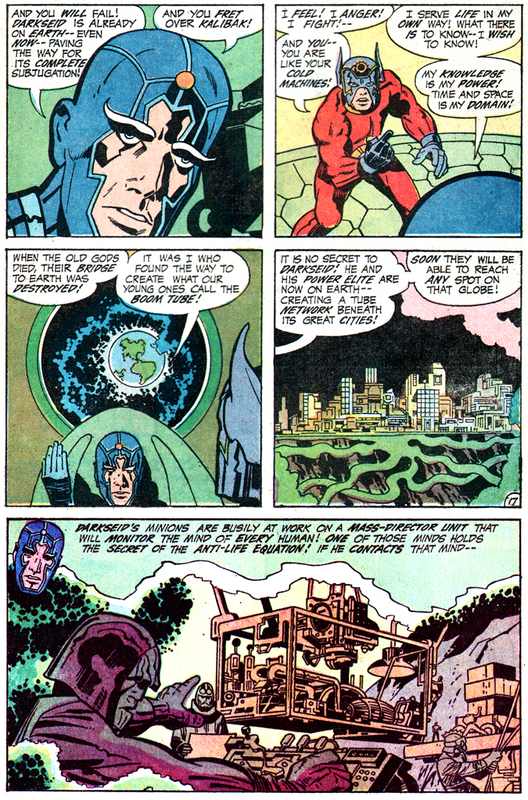 Thus Darkseid, angered at The Forever People and doubtless fearful of Sonny, sends the team (except Serifan) and Sonny Sumo, into different historical eras via the “Total Wipeout” — The Omega Effect. While The Forever People are eventually reunited, Sonny Sumo and Mother Box are sent hundreds of years into Japan’s past, when Sonny becomes a “wise man, athlete, farmer,” and the Mother Box is returned to the Super-Kids, after centuries in the custody of Buddhist monks. Unfortunately, except for brief mentions in “Even Gods Must Die” and The Hunger Dogs — mostly lamentations that the “New Age” of the Micro-Mark has supplanted Darkseid’s great “hunt” — this is basically the last we see of the Anti-Life Equation, but assuredly it was a fantastic concept while it was in play. In the final analysis, the Anti-Life Equation just begs the question: If Darkseid had finally achieved his quarry, to finally subjugate an entire universe to his will, to gain dominion over every single life form in existence… what word would he have used?